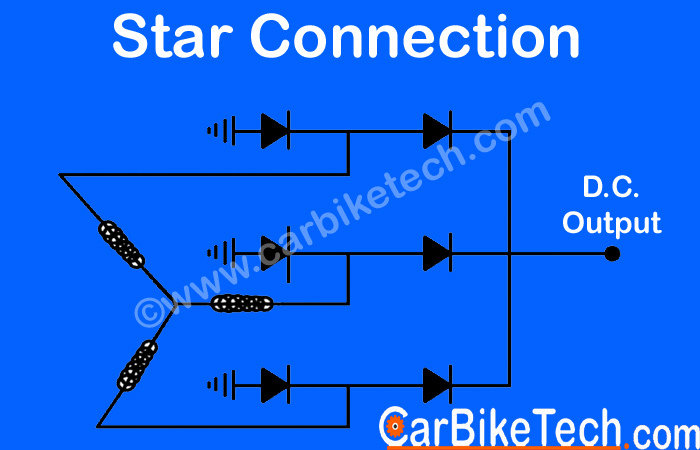 The vehicle electrical system comprises of many components. They include generators to electric wiring harness to connectors and many more. Over the period of time, the electrical system got updates, upgrades, and additions. This is mainly because the number of components operating on electric power and therefore, the power consumption increased substantially. The main function of the electrical system is to generate, store and supply the electric current to various systems in the vehicle. It operates the electrical components/parts in vehicles. These components include several electrical gauges, digital gadgets, power windows, central locking mechanisms and many more. Most components of the earlier generation vehicles were predominantly mechanical in nature and operation. Over the period of time, these components started operating electrically/electronically; shedding their pure mechanical function which the earlier generation vehicles used. Nowadays, the majority of vehicular systems have an electric function for ease of operation and precision control. Even more advanced steering systems such as Electric Power Assisted Steering (EPAS) also operate by electric power. Hence, the engineers felt the need for a consistency in the generation of the electric power. So, they employed different mechanisms to effectively generate, regulate, store and supply the electric current in the vehicles. Earlier generation cars mostly used the positive ground in their electrical system. In this system, the positive terminal of the battery was attached to the chassis while the negative terminal was live. However, later this system was discontinued. Today, modern cars make use of the negative earth in their electrical system. Generally, most cars use the 12 Volts electrical system. However, some small bikes still use the 6 Volts system whereas some commercial vehicles use the 24 Volts system. Magneto is an electric device that generates periodic pulses of alternating current. However, it uses permanent magnets. The magneto does not have a ‘commutator’ which produces the direct current (DC) like a Dynamo. Manufacturers classify the magneto as a type of an alternator. However, it is different from other alternators which use field coils instead of permanent magnets. In earlier days, many devices used hand-cranked magneto generators which produced an electric current. Later, automotive manufacturers employed magnetos to produce high voltage pulses in the ignition systems of some petrol engines. These pulses were responsible for supplying the electric current to spark plugs. 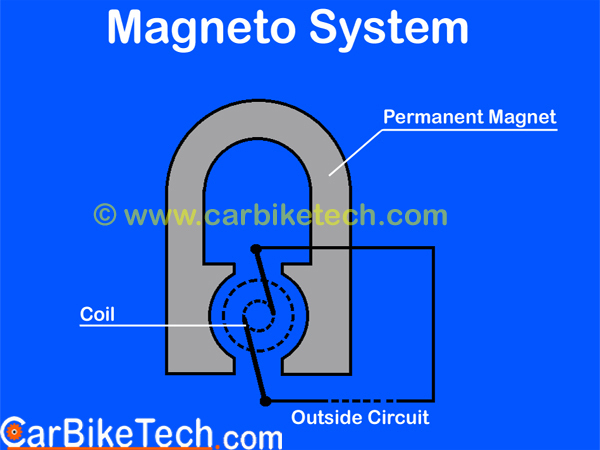 Thus, magneto converts the mechanical energy of the engine into electrical energy to run the engine uninterruptedly. Magneto’s magnetic field strength is constant. The main advantage of the magneto is that its output is steady regardless of load variations. However, if the engine shuts down, then it again needs an external input to restart. Today, the use of such magnetos for ignition is very limited. However, there are a few motorcycles, small bikes, and quads which still use the magneto system. The main advantage of this system is reduced weight. Initially, you need the input from the battery to start the engine. Then, the magneto generates electrical energy from the input of the mechanical energy. A Dynamo/Generator is a device that converts mechanical energy into electrical energy. 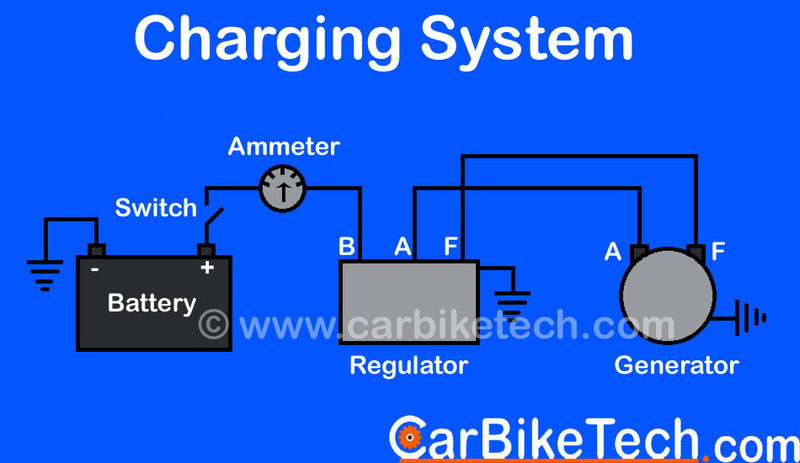 It supplies the electrical energy for charging the battery of a vehicle. The generator gets the drive from the engine, generally thru’ the fan belt. In earlier generation vehicles, you can see this type of arrangement. The speed of the generator largely depends on the speed of the engine. As the engine speed increases; so does the speed of the generator. It varies to a great extent throughout the engine’s speed corresponding to its power-band. However, the situation demands that the generator output should remain nearly constant. Also, another name for the automotive Generator is Dynamo. Furthermore, the automotive generator produces Direct Current (DC). This is because the electric components need the Direct Current to function. 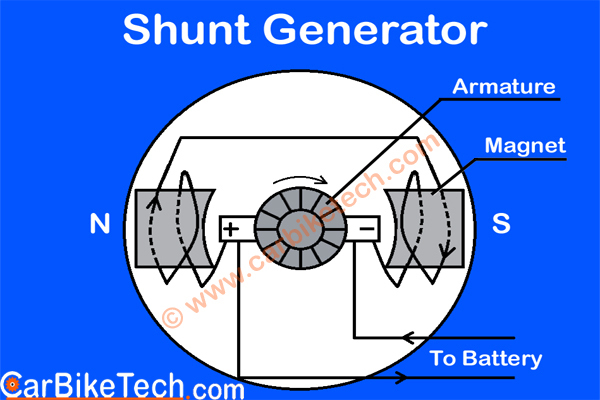 Automotive applications most commonly use the Generator made of shunt winding. Initially, manufacturers employed generators to produce direct current (DC) which the other electrical components/gadgets could directly use/consume. However, now, the Generator is replaced by the Alternator which generates alternating current (AC). It is then converted into the Direct Current (DC) with the help of diodes. The Alternator is also known as the AC Generator. It is a device that produces an alternating current (AC) instead of direct current (DC). Hence, it is known as an Alternator and works on the same principle. In the early 60s, the alternator replaced the DC Generator because of its distinct advantages over the latter. However, the automotive electrical system only uses the Direct Current. So, you need a mechanism to convert the alternating current to direct current. An alternator converts the alternating current (AC) to direct current (DC) with the help of diodes. 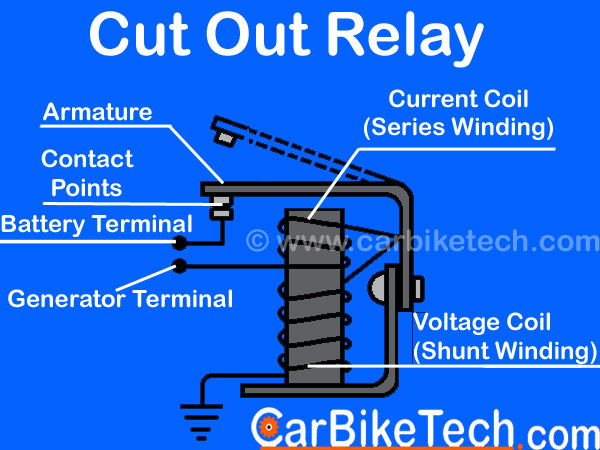 The Cut-Out mechanism regulates and cuts out the current output going to the battery. When the engine is running at very slow speeds, the generator output is usually lower than the battery output voltage of 12 volts. Hence, it is insufficient to charge the battery. In such a scenario, the battery starts to drain out into the generator because the battery voltage is higher than the generator output. To prevent the battery from draining off, manufacturers employ a voltage regulator/Cut-Out. It connects/disconnects the generator from the battery. When the generator output is lower than battery voltage, then it disconnects the generator from the battery, whereas when the output is higher, it connects the generator back to the battery. Thus, it prevents the battery from discharging at slow engine speeds. The main purpose of a battery is to store the electrical energy in the DC form for future use. A car or motorcycle battery is just like any other battery that has two poles: positive and negative. Modern cars use the negative earth technology. The positive pole represents the South Pole while the negative pole represents the North Pole. The positive terminal is generally bigger in diameter than the negative terminal. This is to prevent it from being potentially fitted in a wrong way. Electric Vehicles use more advanced type 'Lithium-Ion' or 'Li-Ion' batteries. These batteries can store more current and take less time to charge compared to conventional batteries. The Li-ion batteries have high energy density and low self-discharge properties. Hence, they offer long hours of operation before needing the re-charge. Bosch, Denso, Lucas and Motherson Sumi are some of the suppliers of vehicle electrical system in vehicles. What is a Turbocharger and how it works?